Automotive led lights have evolved from just merely lighting up the road ahead to beautiful interior decoration. As seen at the 2013 Frankfurt Motor Show in September this year, automotive led lights applications are evolving. Besides the traditional LED DRL or LED tail light, some more interesting LED automotive led lights applications have surfaced at the 2013 Frankfurt Motor Show. Worth noting applications include German car maker Audi’s partnership with Philips to develop 3D OLED rear lights for its Audi R8 model in June 2013, while showing off its automotive LED DRL developed by Osram for the same car. Another interesting application that caught media attention was Opel Monza concept car which uses 18 LED projectors to create an adaptable and customizable multi-function display, according to a Daily Mail report. 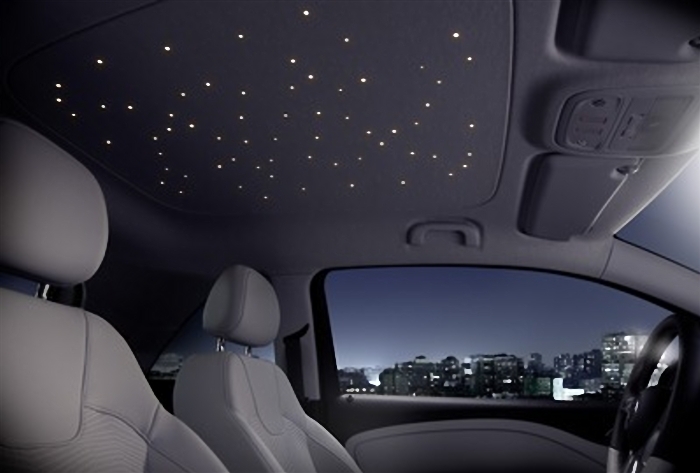 Interior decorative lighting is also more aesthetic with Freudenberg Group deployment of 64 tiny LED lights for interior decorative lighting in the Opel Adam. LED Automotive LED lights Analyst Mr. Lu pointed out, interior decorative LED automotive lighting is still conceptual at the moment, but has the potential to catch on in the future. “LED tail lights are a saturated market, and headlights are still a fairly technically difficult market to enter for most manufacturers,” explained Mr. Lu. “As a result, we expect more automotive led lights manufacturers to move into decorative automotive lighting in the future.” From 2015 onwards to 2017, decorative interior LED lighting is likely to increase and become more common. A consistent trend spotted at different car expos of small number of LED DRL products and excessive number of LED tail lights and led light bars. The phenomenon is caused by a relatively mature LED tail light market, and a just budding LED DRL market, said Mr. Lu. LED DRLs will be increasingly widely adopted by car manufacturers as it plays a crucial role in brand recognition and styling, said George Craford, Senior Fellow, Philips Lighting in an interview with LEDinside in July 2013. Will OLED Become the Next Big Thing? Asked about Osram’s recent claim that OLED technology is becoming the next major automotive lights trend, Mr. Lu pointed out it will not be after 2017 that OLED becomes widely adopted. Osram’s claim of launching its OLED automotive lights technology by 2016 will be the beginning of things to come, said Mr. Lu. “OLED technology is still relatively unstable when it comes to thermal resistance, an important feature in vehicles since the light needs to function under very hot or cold temperatures,” said Mr. Lu. Automotive led lights manufacturers might turn away from OLED lighting, as it tends to have a much shorter lifespan than LED. Currently, OLED is only used in high-end concept cars by Audi and BMW, and it will take a long time before it is adopted in lower end vehicles. It will also be fairly difficult for automotive industry to adopt the technology, when it is still unpopular in the consumer market. The main obstacle to OLED’s wide adoption in automotive lighting is still price. Although, Osram has made a significant technological breakthrough in terms of its OLED thermal stability by functioning for several hours under temperatures of 85 degrees Celsius (an important milestone for tail light applications), adoption will still be mainly affected by pricing. OLEDs higher prices have been caused by its relatively lower yield rates compared to LED, which effects manufacturers’ willingness to adopt the technology. Overall, the automotive lights market is still opening up to LEDs, and it will take an even longer time before OLED becomes a mainstream lighting technology. However, for styling conscious manufacturers, LEDs can be used both in exterior appearance and also for interior decorations. It will still take some time before LED based lighting moves from high-end cars to the average Toyota Camry. Besides the traditional LED DRL or LED tail light, some more interesting LED automotive lighting applications have surfaced at the 2013 Frankfurt Motor Show. Worth noting applications include German car maker Audi’s partnership with Philips to develop 3D OLED rear lights for its Audi R8 model in June 2013, while showing off its automotive LED DRL developed by Osram for the same car. Another interesting application that caught media attention was Opel Monza concept car which uses 18 LED projectors to create an adaptable and customizable multi-function display, according to a Daily Mail report. Interior decorative lighting is also more aesthetic with Freudenberg Group deployment of 64 tiny LED lights for interior decorative lighting in the Opel Adam. LEDinside LED Automotive Lighting Analyst Lu pointed out, interior decorative LED automotive lighting is still conceptual at the moment, but has the potential to catch on in the future. “LED tail lights are a saturated market, and headlights are still a fairly technically difficult market to enter for most manufacturers,” explained Lu. “As a result, we expect more LED automotive lighting manufacturers to move into decorative automotive lighting in the future.” From 2015 onwards to 2017, decorative interior LED lighting is likely to increase and become more common. A consistent trend spotted at different car expos of small number of LED DRL products and excessive number of LED tail lights and bar lights. The phenomenon is caused by a relatively mature LED tail light market, and a just budding LED DRL market, said Lu. LED DRLs will be increasingly widely adopted by car manufacturers as it plays a crucial role in brand recognition and styling, said George Craford, Senior Fellow, Philips Lighting in an interview with LEDinside in July 2013. Asked about Osram’s recent claim that OLED technology is becoming the next major car lighting trend, Lu pointed out it will not be after 2017 that OLED becomes widely adopted. Osram’s claim of launching its OLED automotive lighting technology by 2016 will be the beginning of things to come, said Lu. “OLED technology is still relatively unstable when it comes to thermal resistance, an important feature in cars since the light needs to function under very hot or cold temperatures,” said Lu. Automotive manufacturers might turn away from OLED lighting, as it tends to have a much shorter lifespan than LED. Currently, OLED is only used in high-end concept cars by Audi and BMW, and it will take a long time before it is adopted in lower end vehicles. Overall, the automotive lighting market is still opening up to LEDs, and it will take an even longer time before OLED becomes a mainstream lighting technology. However, for styling conscious manufacturers, LEDs can be used both in exterior appearance and also for interior decorations. It will still take some time before LED based lighting moves from high-end cars to the average Toyota Camry.